What is Home Business Insurance? 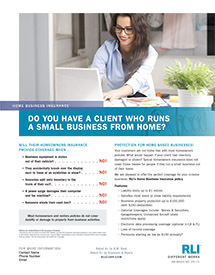 Home based business policies are designed specifically to handle the business insurance needs of a business that is operated from an insured’s home by providing coverage for business personal property (equipment, inventory and supplies) and business-related liability exposures. In addition, a Home Business Insurance policy can provide coverage for lost income. Coverage provided includes losses or damage from business activities conducted at the insured’s home or off-site at another location. That means business property is protected while an insured is in transit and provides liability coverage when they are performing business-related activities at a craft show or someone else’s residence. RLI’s Home Business Insurance fills the gaps left by most insurance policies. 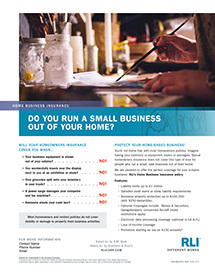 The RLI Home Business Insurance policy, specifically designed for home-based businesses, crafters, and hobbyists, is written on an ISO BOP form. While standard homeowner endorsements offer some coverage, many DO NOT cover most business-related losses. Who qualifies for RLI Home Business Insurance? Applicant must live in a U.S. state or the District of Columbia. Applicant is looking for business personal property insurance and business general liability coverage, NOT homeowners insurance, professional liability insurance or automobile insurance. Applicant business is home-based, not located in a retail store or commercial office space. Note: this does not mean all business activities must be conducted at the home. It is acceptable to operate from another site, such as a craft show, on a temporary basis. The type of business is eligible for RLI Home Business Insurance policy. 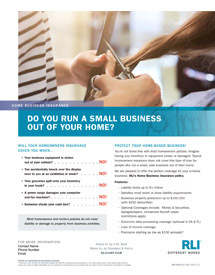 RLI Home Business Insurance is available through independent insurance agents. 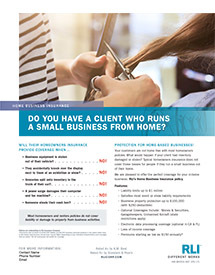 If you are a small business owner and need insurance for your home-based business, please contact your local agent. If you are an independent agent, follow the steps below to apply for coverage for your clients home based business. First, check the list of qualified home businesses and qualification requirements. Then, complete an RLI Home Business Insurance policy application. Our applications are provided in pdf format and can be filled in online. Once complete, save and print the application, review it for eligibility and have the insured sign it. Last, contact RLI at 1-309-689-8686 for a referral to a program administrator authorized to do business in your state. You must submit the application with an approved program administrator. 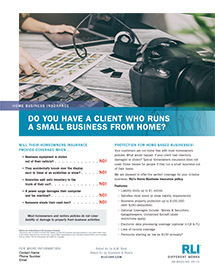 RLI offers free customizable marketing materials for agents to provide to their clients for more information on RLI's home business insurance. These materials are provided in pdf format and may be customized with agent's contact information. Contains an overview and lists the benefits of RLI's Home Business Insurance coverage. One sided customizable PDF size: 8.5" x 11". CUSTOMIZE and PRINT NOW! CUSTOMIZE and PRINT NOW! CUSTOMIZE and PRINT NOW! CUSTOMIZE and PRINT NOW! 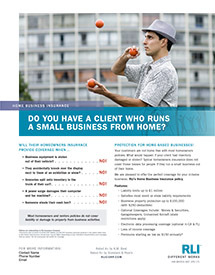 Contains an overview and lists the benefits of RLI's Home Business Insurance coverage. Two sided customizable PDF size: 8.5" x 3.67". To place an order for printed buckslips, contact HBI underwriting or your Program Administrator. Immediately available for administrators to customize and print or send electronically. 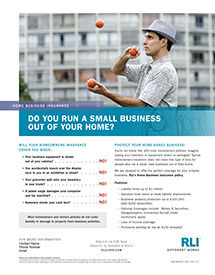 Contains an overview and lists the benefits of RLI's Home Business Insurance coverage. One sided customizable PDF size: 8.5" x 11". Ideal for cross-selling opportunities. Contains a brief overview and lists the benefits of RLI's Home Business Insurance coverage. Use as a handout or mail to the prospective insured. Two sided PDF size: 8.5" x 3.67".